Author and commentator Michael Eric Dyson delivered the keynote address at Illinois State University's Martin Luther King Jr. cultural dinner at Redbird Arena. Best-selling author Michael Eric Dyson had harsh words for President Donald Trump as he spoke of the “resurgence” of white supremacy at a Martin Luther King Jr. cultural dinner at Illinois State University on Friday. Dyson spoke of white privilege in a question-and-answer session with students and faculty, saying the Charlottesville riots and debates over confederate monuments show white supremacy is on the rise. 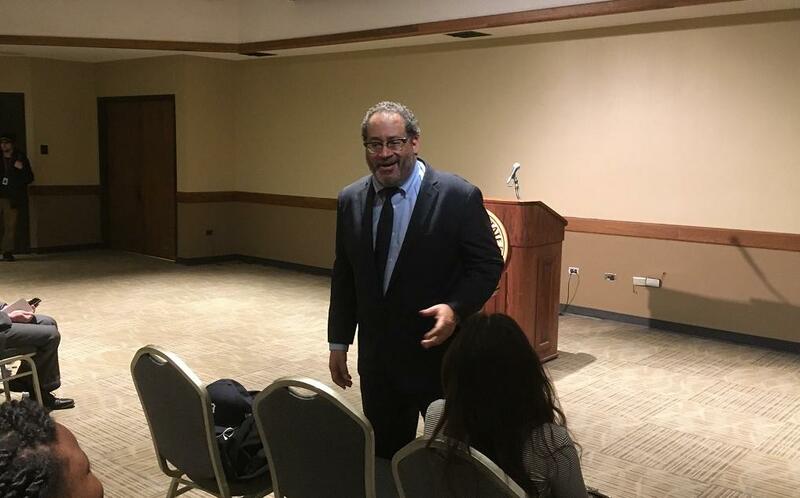 Author and commentator Michael Eric Dyson spoke to about 40 students and faculty and lllinois State University on Friday prior to his guest appearance at ISU's Martin Luther King Jr. cultural dinner. Dyson added there's white supremacy ideology in the White House, though he said Trump isn't smart enough to orchestra such a campaign. “Donald Trump’s problem is he is attracted to those things which will fuel and foster such horrible and deadly consequences for the sake of political thrill or winning or the narcissism that is white supremacy,” Dyson said. Dyson cautioned Democrats they won’t beat Trump in 2020 unless they unify behind a candidate. Dyson added Barack Obama didn't do enough for racial justice when he was president. “We didn’t expect Obama to be a Black Panther or Martin Luther King Jr., that’s not his role. He’s the president, but most other presidents have had to deal with this issue,” Dyson said.